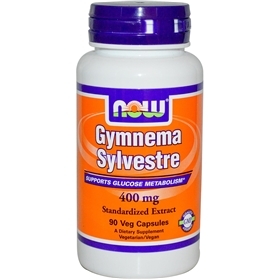 NOW Gymnema sylvestre Extract is a standardized herbal extract which supports healthy glucose metabolism and pancreatic functions. Our Gymnema extract is standardized to contain a minimum of 25% Gymnemic Acid. Helps conditions such as diabetes and low blood sugar, & helps to lower Hemoglobin A1c. Some research also suggests that gymnema sylvestre extract can help repair and regenerate the beta cells in the pancreas that produce insulin. Gymnema contains certain compounds, such as acidic glycosides and anthroquinones, that are sweetness inhibitors. This is noticed with both artificial and natural sweeteners, and plays a role in Gymnema's value as an appetite suppressant. As a weight loss product, gymnemic acids have a sugar blocking property during the digest of foods. This helps not only to balance blood sugar, but also promotes lean body mass by lessening the amount of sugar that gets stored as fat. Studies have shown Gymnemia's use in diabetic therapies, due in part to its ability to promote normal blood sugar and positively affect insulin production.